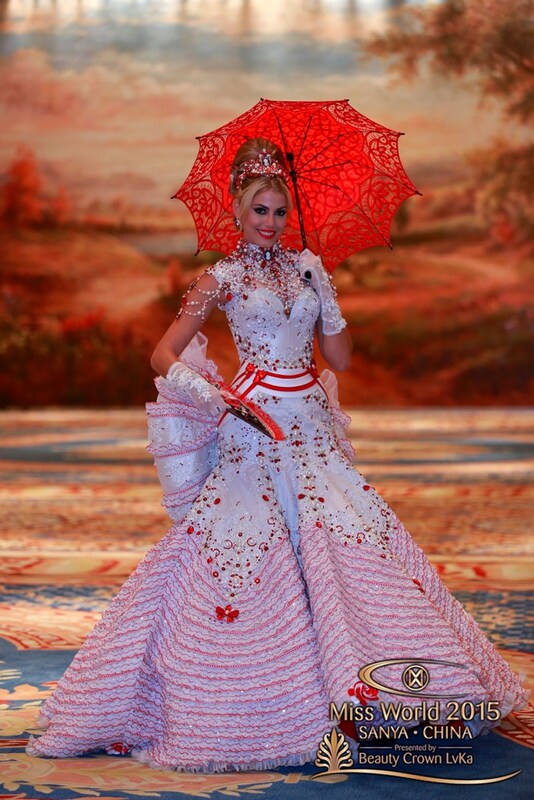 The 65th Annual Miss World Beauty Pageant kicked off last week in Sanya Hainan Island, People's Republic of China. 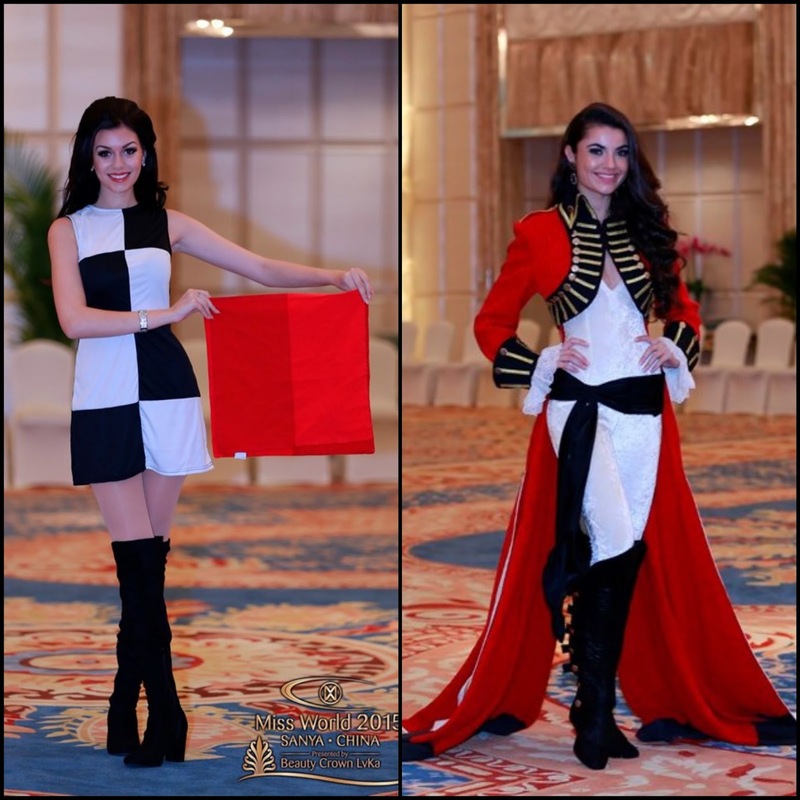 The finals of the 2015 Miss World will be on December 19th. Coincidentally, the other International beauty pageant "biggie", the Miss Universe 2015 pageant finals will occur the following day, December 20th--in Las Vegas Nevada USA. 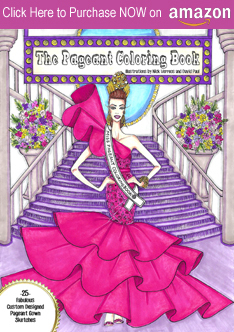 So, in terms of beauty pageants and beauty pageant followers, that will be a big weekend! For this year's Miss World, over 100 contestants from all over the world are vying for the coveted title (minus Miss Canada World who was not allowed to enter China). Miss Brazil World Catharina Choi: Festive, very Rio Carnival-like costume with bright Igor Stravinsky "The Firebird"-like styling. She said it is inspired by the birds in her country. Of course it is. I could definitely see Catharina in a Carnival float in this costume. Colombia Maria Alejandra Lopez: I love this bright, fun costume worn by Miss Colombia World. 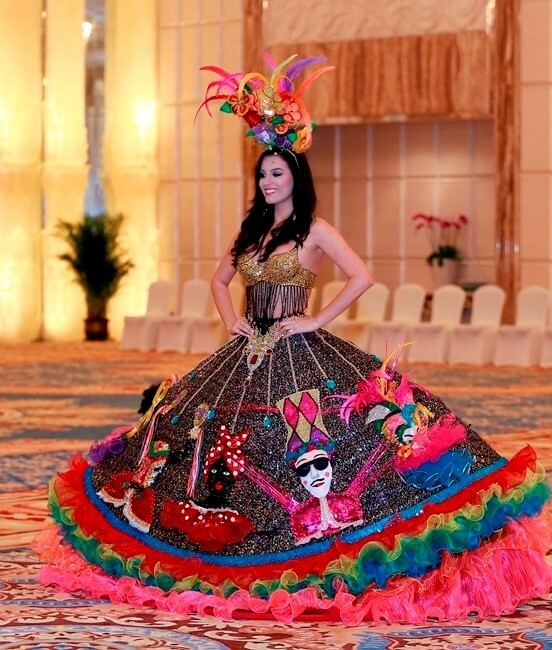 It was designed by Edgar Perez and represents a "fantasy" creation of the Queens of the Barranquilla Carnival. It shows images of different representations of the Colombian people, the bright carnival-like colors and the shape of the oversized skirt hints at the iconic Colombian Sombrero Vueltiao (Vueltiao Hat). Very impressive. 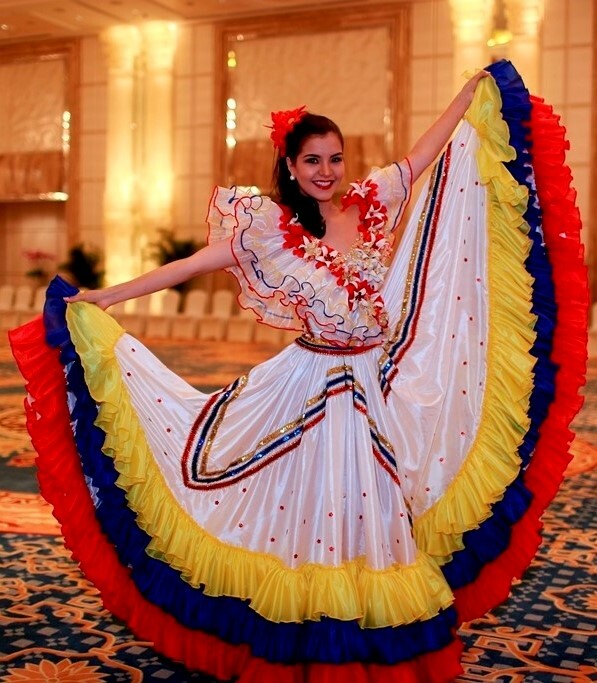 Ecuador Camila Maranon: Camila's costume is very traditional in terms of its folkloric styling, featuring the yellow, blue and red of her country's flag. Venezuela Anyela Galante: Anyela's costume--also folkloric in its design--was inspired by Teresa Carreño, Venezuelan pianist, singer, composer who was a very influential figure in her country. The gown is very intricate with hundreds of sequins, pearls and layers upon layers of gathered trim--in fact 500 meters of "bobbin lace" (encajes de bolillo). 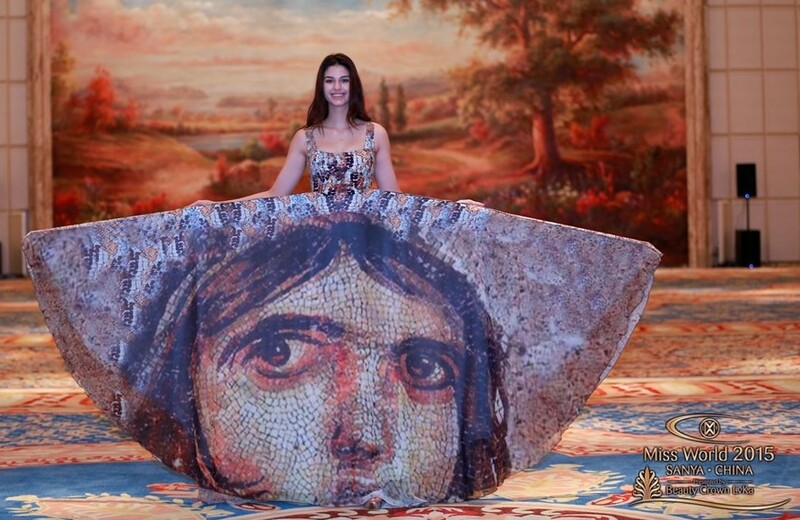 The costume was designed by Venezuelan designer Nidal Nouaihed. El Salvador Marcela Santamaria: Marcela looks quite chic and serene in her national costume featuring an emerald green tiered skirt, lace edge trim, a lace mantilla headpiece, golden midriff, ivory lace top section and lovely depictions of native women in the bottom tier of her skirt. I especially love her very model pose. 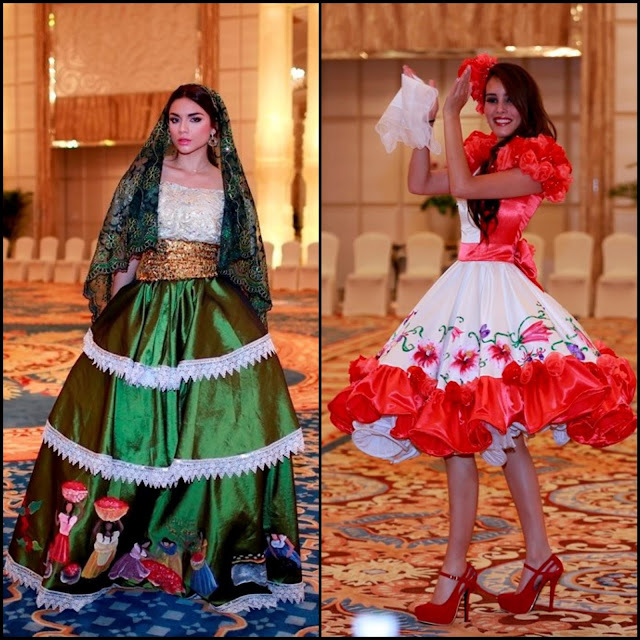 Chile Fernanda Sobarzo: Fernanda wears a Chilean costume worn at traditional Cueca dances. 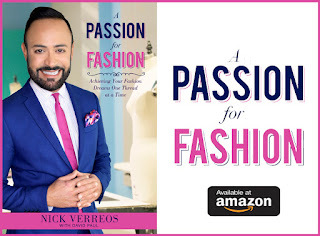 The dress has a full skirt with petticoat underneath; a wire satin ruffle hem; waist sash and bow plus her handkerchief as the finishing accessory. Oh, and lots of flower details. Somehow, I am not sure if those suede platform pumps are normally utilized in this dance, but I give her a pass: she's a beauty queen. She needs heels! Panama Diana Jaen: Miss Panama World's costume represents the popular Pre-Columbian style seen in lots of Latin American beauty queens national costumes. This particular one has to do with a story of a local woman who would kill any of the Spaniards who came to her native land looking for gold, the tale is entitled "El Salto de la niña de Puerto Pilón". Diana says that the costume weighs A LOT (understandably); the headdress alone weighs a supposed eight pounds. Nicaragua Stefania Aleman: This Pre-Columbian Nicaragua National Costume was designed by Jeff Manzanares, The mask on her hand represents the Güegüense which was declared a cultural heritage site by UNESCO in 2005. With this outfit, Stefania presented the dance of the 'inditas', representing the mixture of Spanish culture and native Nicaraguan culture. Also represented on the outfit is El Toro Huaco which is a dance and a legend from the province of Carazo, Nicaragua. Guatemala Maria Jose Larrana: Maria Jose also wears a Pre-Columbian type costume with feathers, sequins and a very impressive headdress. I especially like her accompanying makeup and not too distracting gold heels. 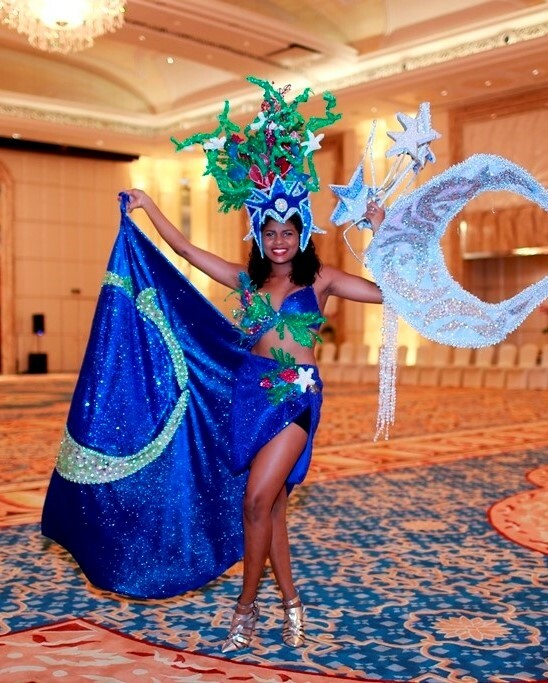 Belize Jasmin Jael Rhamdas: Miss Belize World's costume features the colors of her country's flag as well as a sequined half-moon and depictions of ocean "flora and fauna" and corals from her country. I like it for the most part; if only she would have not worn black hot pants...and instead a blue sparkle pair of shorts that matched the rest of the costume. I also think the gold heels were a little distracting. I suggest that she should have done silver, to match the half-moon. Belgium Leylah Alliet: The colors of the Belgium flag are incorporated into this mermaid-shaped design with sequins and feathers for Miss Belgium World 2015. Slovakia Luzja Strakova: Luzja's traditional Slovak costume represents the celebration and pride of the Slovakian people. The main focus of her outfit is that hat, which is a playful interpretation of a traditional Slovakian wedding hat. She says that her costume took over 1 year to make and every detail was handmade! Czech Republic Andrea Kalousova: Andrea also dons a traditional costume with the flowered headpiece. England Natasha Hemmings: Natasha's costume has color hints of the England flag but at the same time, gives nods to English Formula One World Champion Lewis Hamilton. Gibraltar Hannah Bado: Very traditional. Very Gibraltar. Italy Greta Galassi: Greta's national costume looks a bit more "Sound of Music" Austria, Swiss Alps as opposed to Italy but she might be vibing the Northern part of Italy, I guess. She's more schnitzel and less pizza. 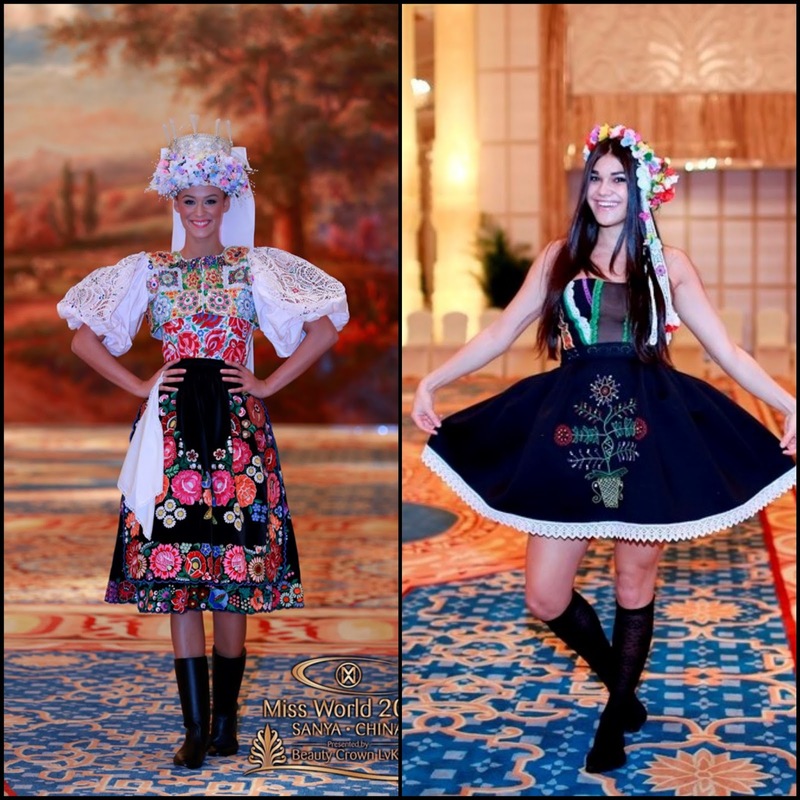 Hungary Daniella Kiss: Daniella's costume is very representative of the Hungarian national dress with the national colors. She says that she performs a typical Hungarian gypsy dance in this. 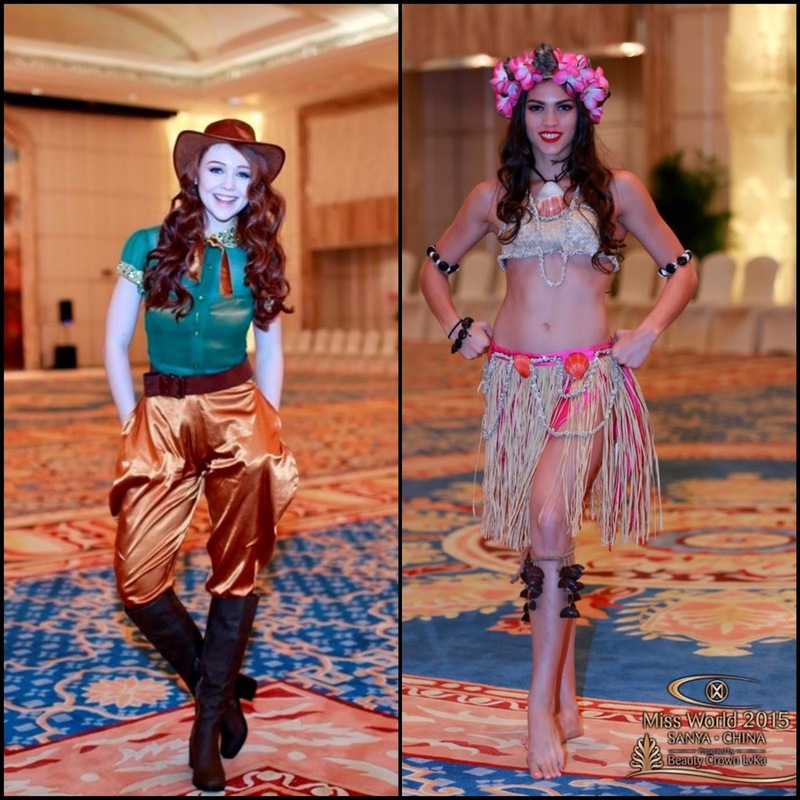 Ireland Sacha Livingstone: Sacha's costume is iconic Irish Celtic dance-inspired. I think its quite cute, down to the correct lace-up "Ghillie" slippers. Bahamas Chantel O'Brien: Chantel is dressed as the straw doll. Together with straw, her outfit is also made with flowers, which can be found all over the Bahamas. There are details such as shells and a burlap finish which gives it a very wavy look. 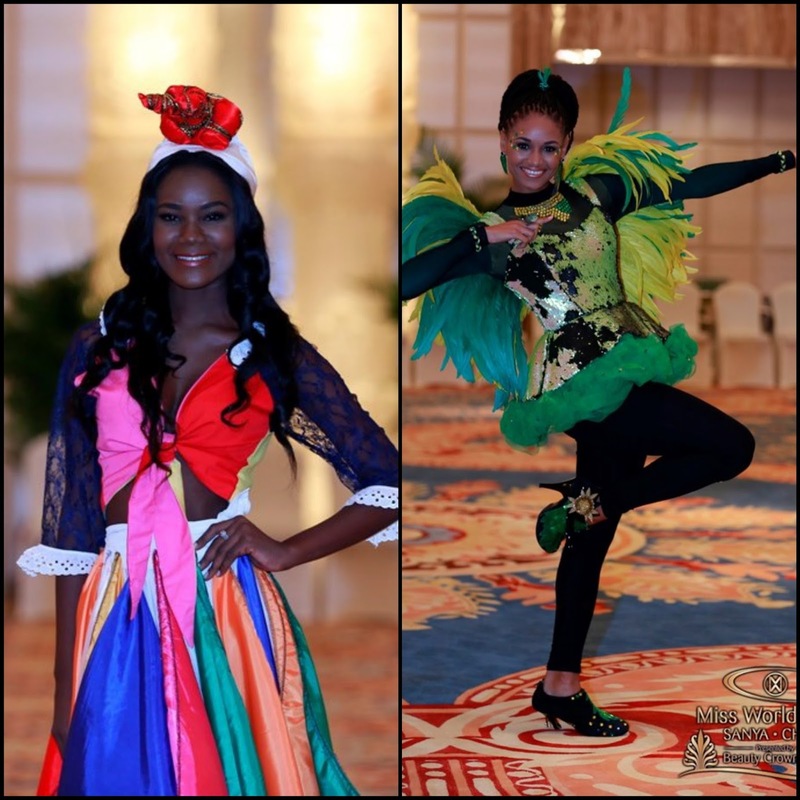 Haiti Seydina Allen: The colors of Haiti are exemplified in this costume of Miss Haiti World. The design features a knot-tied top and multicolored godet skirt and lace sleeves. 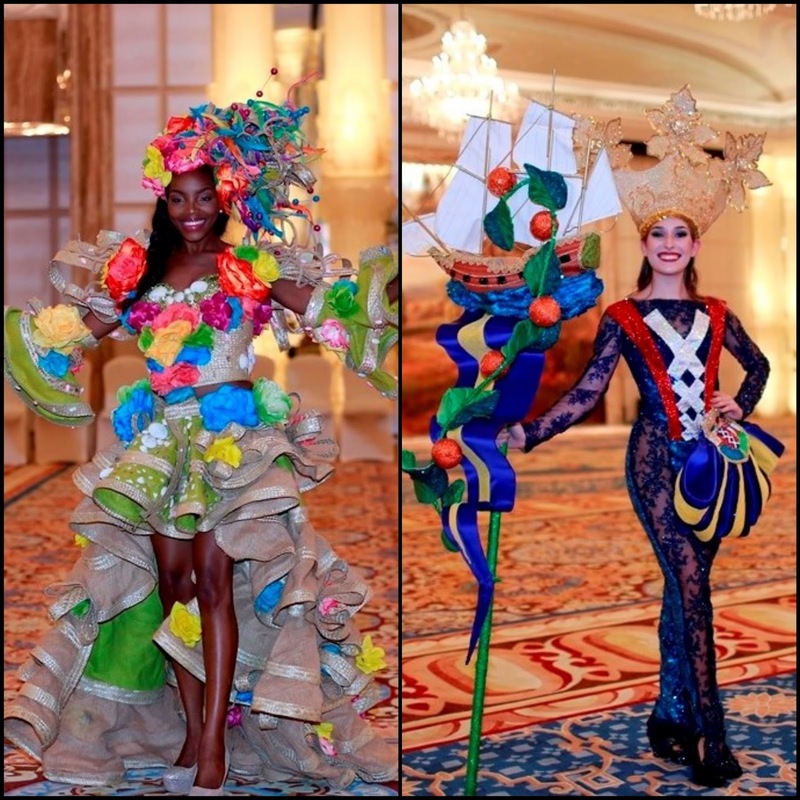 Jamaica Sanneta Myrie: Jamaica, Usain Bolt and his iconic "pose" are well represented in this costume worn by Miss Jamaica World Sanneta Myrie. Gabon Reine Ngotala: Reine's costume is like a high-fashion version of a traditional Gabon national ensemble. Great colors, lovely leaf prints and I love the asymmetry of the top section--as well as headdress and fan. I just wished she wouldn't have worn those black heels; they distracted from her costume. Turkey Ecem Cirpan: Ecem is six feet tall, and if that isn't enough, she wore this gorgeous costume showing the artistic tile work. This "costume" is EVERYTHING! Vietnam Tran Ngoc Lan Khue: Miss Vietnam World's costume is a traditional Vietnamese Ao Dai traditional ensemble of long tunic with side slits and accompanying wide-leg palazzo-like pants. 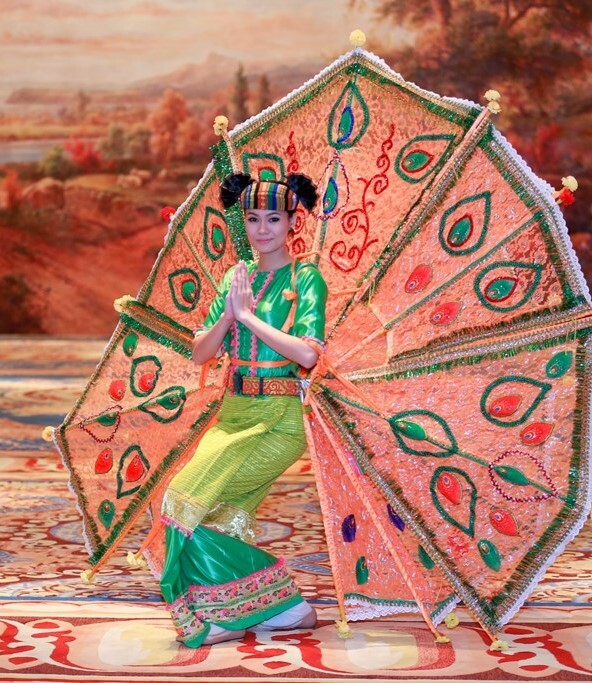 Thailand Thunchanok Moonnilta: Thunchanok's national costume is inspired by the Northern region of Thailand. All of the materials to make the dress as well as the elaborate headpiece were crafted by the people of Northern Thailand, and represents the fusion of Lanna and Thai cultures. 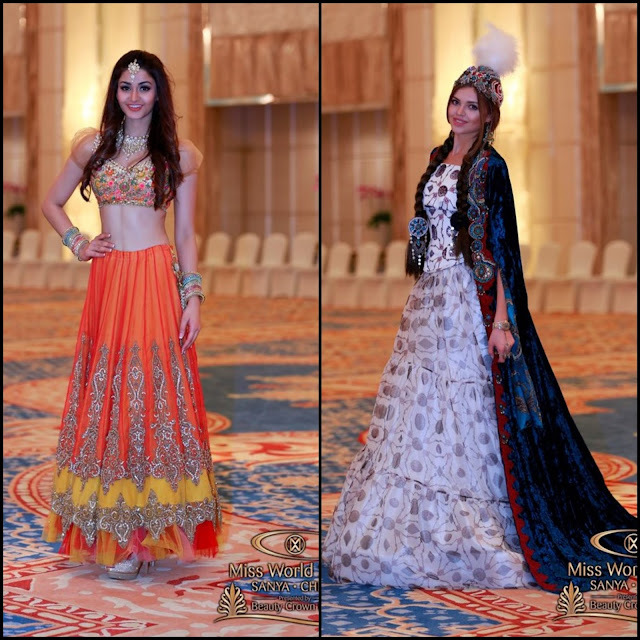 India Aditi Arya: Aditi's costume is an Indian costume with crop top and pleated skirt. She definitely looks like a Bollywood actress...during a dance number. Kazakhstan Regina Vandysheva: Regina went a bit traditional with her a-line shaped costume and coat. 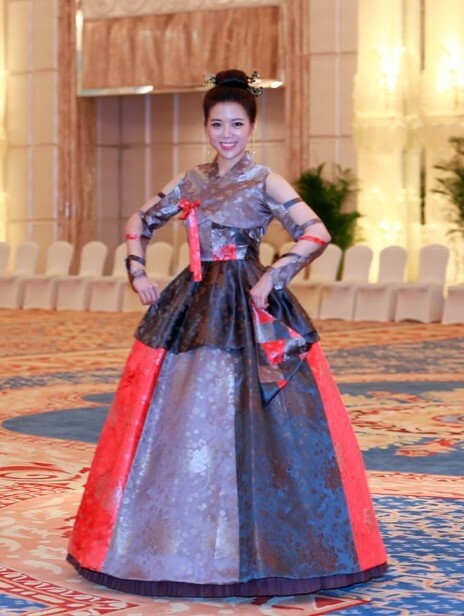 Korea Jun Eun-ju: Miss Korea World's dress is a combination of the old traditional Korean Hanbok but the addition of cutouts on the sleeve represents the modern Korea. On the skirt, there is a quilt, which represents the Joseon Dynasty. Myanmar Khin Thein Myint: One of my favorite "Miss World 2015" costumes; the colors, the design; the mixing of traditional and fantasy. Super Fabulous. Australia Tess Alexander: Tess' look is the same costume worn by last year's "Miss Australia World" Courtney Thorpe. The outfit was designed by Julie Sulfi of Belluccio and was inspired by the Women's Land Army, paying homage to the women who worked in agriculture during World War II. 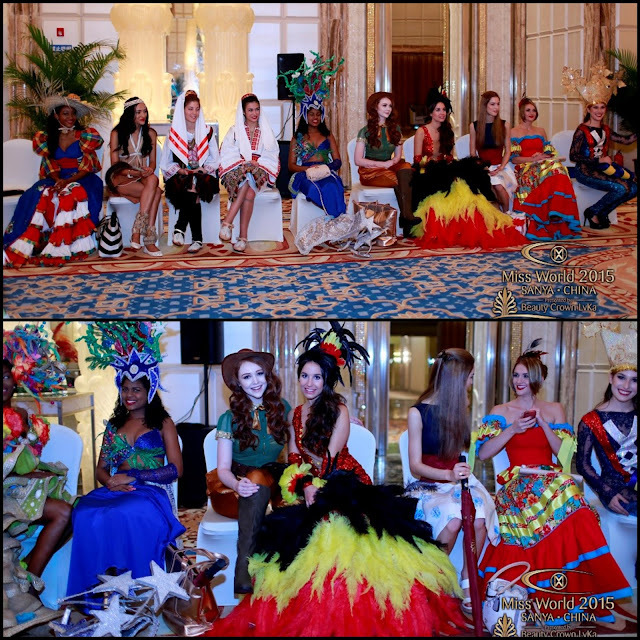 Guam Aria Perez Thiesen: Aria's straw skirt, flower head crown and shell accessories pays tribute to the Chamorro Dance of Guam. I think this is both fun and very traditional. She's very pretty by the way! 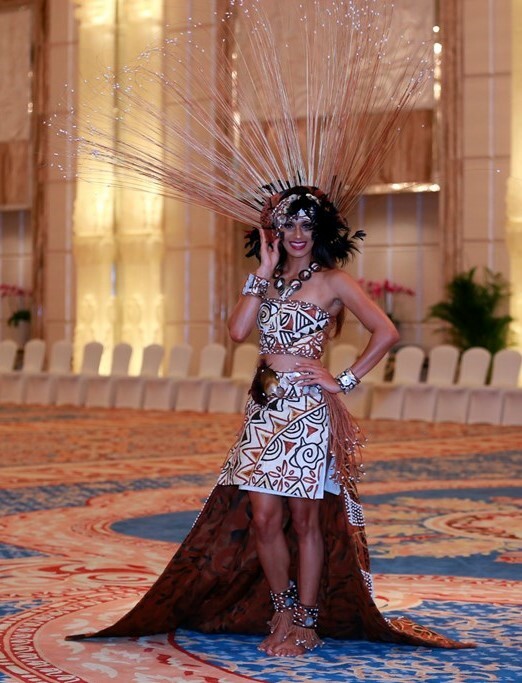 Fiji Brittany Hazelman: Brittany's costume represents Fiji’s diversity and elegance and the traditional values of Fijian people, according to her. The patterns featured in her costume represent the people of Fiji and their unique rituals, as well as the diversity of the population. Can't wait to see the "Dances of the World" segment during the "Miss World 2015" Live Finals on December 19th. The show will be aired in the US on E! the morning of December 20th--the same day as "Miss Universe 2015". 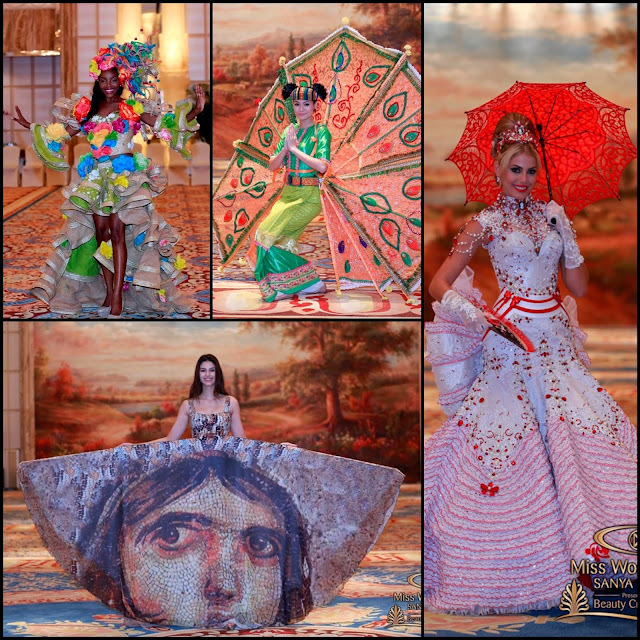 1 Response to "SASHES AND TIARAS.....Miss World 2015 National Costumes Highlights "